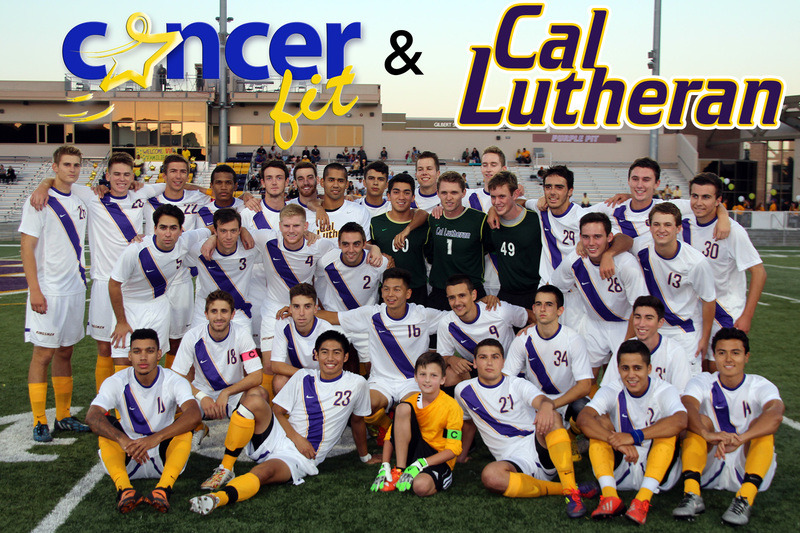 THOUSAND OAKS, Calif. – On a night dedicated to raise awareness for childhood cancer, the fans and the Cal Lutheran men’s soccer team came decked out in gold, but it was not enough to top a tough Pomona-Pitzer squad as the Kingsmen fell 2-0 on Saturday night at William Rolland Stadium. Joining forces with Cancer Fit, Inc. the men’s soccer team wore gold socks, the color to recognize childhood cancer, and a large crowd was on hand to support the Kingsmen in their matchup against the Sagehens. Eight-year old team member Dylan Roslauski, who was drafted to the team through the MVP Sports Draft program, served as the honorary captain in the game. The MVP Sports Draft program helps to match childhood cancer survivors with a high school or college team in the Southern California area.